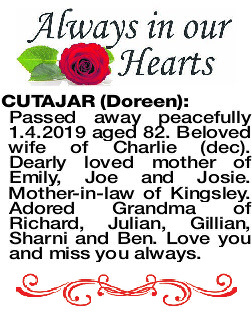 CUTAJAR DOREEN Passed away peacefully 1.4.2019 aged 82. Beloved wife of Charlie (dec). Dearly loved mother of Emily, Joe and Josie. Mother-in-law of Kingsley. Adored Grandma of Richard, Julian, Gillian, Sharni and Ben. Love you and miss you always. The Funeral Service to celebrate the life of Doreen Cutajar will be conducted in the West Chapel at PINNAROO Cemetery on TUESDAY (9.4.2019) commencing at 10.00am. 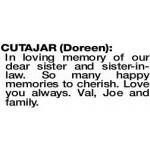 CUTAJAR DOREEN In loving memory of our dear sister and sister-in- law. So many happy memories to cherish. Love you always. Val, Joe and family.